Surprisingly enough, yet still a fully programmed model, the human brain has the ability to free itself from its program, of course, if it takes up the force of exertion and does not cling to the nature that formed us. In the world of scientific achievements, a statement on the possibility of altering DNA seems absurd, although much has already been done in this field, for example, by Chinese specialists from Zhongshan University in Guangzhou. Specialists from this university succeeded in replacing the DNA section responsible for the development of a serious disease. The 2015 Nobel Prize in Chemistry was awarded jointly to Tomas Lindahl (Sweden), Paul Modrich and Aziz Sancar (USA) for studies on the methods of DNA repair. However, the secret of all DNA-related potential lies in the genome’s other living conditions. It can be subordinated directly only to the human brain — either accidentally or intentionally. For this purpose, it is important to know the brain’s potential. In addition, only the brain can intervene in the program without traumatizing the personal nature of an individual or their code. Of course, much depends on the brain exertion capability one is born with, i.e. whether they can adjust the activity of their brain from the outside, i.e. nourish themselves using generated waves, which cling to the exertion potential in the head (for example, in the hypothalamus). In ancient times, the task of this endeavor was to obtain a new type of exertion potential by changing the shape of the skull and, consequently, of the brain. The question lies solely in the ability or inability of DNA to accept the additional exertion potential in our brain. We do so from the outside, by force. If we do this from the inside by ourselves, it means that the DNA allows such an activity, which is indeed quite interesting. Human adaptations and changes to new realities in life is a function of DNA that hides from sight a litany of opportunities. 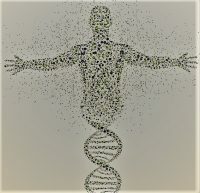 There are many things hidden in our DNA that never leave it, as DNA’s vibration itself is the ruling force which defines us; it can be pierced only by the brain, and more accurately, by the exertion potential of the brain. The fundamental mistake of human existence has been its failure to understand the bonds between the brain and DNA that lead to the completion of unfinished intracellular processes, including the replication (synthesis) and transcription (building) of DNA. The question regarding properties that can enhance our capabilities is indeed a question of the brain. This means that we limit ourselves by what limits us. We should be interested not only in copying cells, but also in improving them. And cell improvement is the same as improving the copying process. If one does not improve this process, the copying of cells only deteriorates over time.